Last week I overheard Kola introducing Morayo-Hope to a song I loved as a child. "I love you daddy, oh daddy! ", I heard her singing along as she cradled his phone and bounced around the living room. He said it was his favourite daddy song and it took me back to my own childhood when I would belt out that song at the top of my voice, willing the words to travel all the way to my dad in India where he remained working after my mum passed away. As I watched Morayo-Hope replay the song and belt it out, I saw the same passionate love I had for my dad at her age. Kola is an incredible dad. I can't even begin to thank God for the kind of dad he is to our children. As readers of our blog know we've had quite the journey with our little man, but the way this guy has just been a rock is incredible. I can tell you now that it's not every guy that hangs around for the hard times. I have enough friends and relatives that were left holding the baby when the rubber hit the road. Throughout the time when I felt like I had some kind of rotten womb or that I had done something wrong to affect our beautiful boy, Kola stayed steadfast. He is the the one praying over him and rolling all over the floor with him. He celebrates every one of Judah's milestones with such gusto and has helped me see what he sees. He's the one taking days off work to attend important appointments with me, and be at Morayo-Hope's special days at school. He's the one sacrificing his wishlists so we can have the things we wish for. Kola has put us front and centre in everything he does and every decision he makes. I see his face fall whenever a snide comment is made about dads / black dads/ Nigerian dads. It's easy to hear about bad fathers because we shout about them. Loudly. But I have decided to shout about this good dad. This good black dad. This good Nigerian dad. We love you Kola & we are proud of you. The white face on this watch really helps it stand out against his skin tone. You can buy it here. When the opportunity came for me to partner with Jord watches for Father's Day, it was a no-brainer. Here's an opportunity to celebrate the man we love with something I know he will love. He recently bought wood sunglasses so I know we are on the right track! He's definitely one for going off the beaten track and curve-balling your expectations. If the dad in your life bucks the stereotype, consider getting him a watch that matches his persona. You can even get it engraved. The full men's watch selection is here. Your watch will arrive presented in a beautiful wooden box - perfect for him to store his cufflinks etc inside...or your trinkets! I know for some, it has been your mum being both mum and dad in your home. If you feel like treating her to a special gift, Jord have beautiful women's watches too. Full selection here. 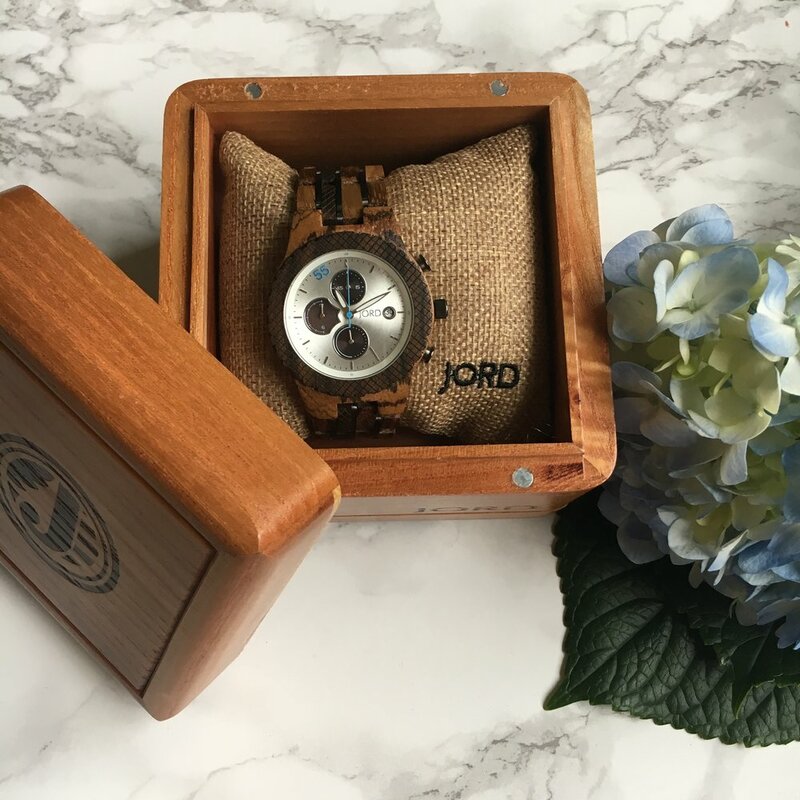 We have partnered with Jord Watches to giveaway a $100 gift code to one lucky person! All you have to do is enter your details here. All entrants will receive a $25 gift code so it's well worth entering! The giveaway ends on Sunday June 25th, so get entering. Good luck!